Dr. Rathnam Chaguturu is the founder and CEO of iDDPartners, Princeton Junction, NJ, USA, a nonprofit think tank that focuses on pharmaceutical innovation, and author of the book Collaborative Innovation in Drug Discovery. He talks to Jonathan Rose for ChemViews Magazine about the current state of drug discovery in industry and academia and what kind of partnerships might lead to success. After getting a biochemistry degree, you spent time in both academic and industry drug discovery R&D. Can you reflect on your career path? I am a plant biochemist by training, but a chemical biologist by profession. My career path has taken many twists and turns, but the common theme has always been how best I could contribute to the advancement of science, the science of making our lives better. I completed my Ph.D. in about three years at the age of 25, at Sri Venkateshwara University, Tirupati, India. After my brief postdoctoral work at the University of Wisconsin, USA, I joined the Biochemistry faculty at Rutgers and then quickly moved on to work in industry for Dow Chemical, FMC, and Sierra Sciences for the next 28 years. In 2007, I came back to academia and joined the University of Kansas to drive its drug discovery operations and help secure Cancer Center designation from the National Cancer Institute. In late 2011, I was recruited by SRI International, a nonprofit research organization, to help lead its Center for Advanced Drug Research Center in Harrisonburg, Virginia, USA. So, it was academia to industry to academia to a nonprofit, from plant science to pest control to pharmaceutical research… a very unique career path that very few others have traveled. What have you learned about the different aspects of pharmaceutical research on this path? Along the way, I learned what works best in industry, what motivates the academic researcher, and what drives a nonprofit that primarily depends on federal dollars. Needless to say, I also came to experience firsthand what doesn’t work in these divergent sectors and the misconceptions that they have about each other. Can you be a bit more specific about that? Academia has traditionally been involved in understanding the fundamental aspects of disease biology, the associated biological pathways, and identifying the relevant biochemical targets for therapeutic intervention. The pharmaceutical industry, savoring the fruits of federally funded academic research, has always been driven by market needs and return on investment. The balance between risk and reward can determine the investment and priority of a project for a given institution or company. The risk of a drug discovery project can be measured by the likelihood of success, return on investment, or potential for passing clinical trials. An innovation crisis in the pharmaceutical sector in recent years has left the pharma managers knocking on academia’s doors as an avenue to grow its pipelines. Pharma is in an all-out sprint to embrace partnerships with academia. These partnerships are always fraught with tension. However, if these two divergent sectors learn to respect and understand each other’s core missions, the opportunity is enormous. We held a “town hall” meeting at the Kauffman Center, Kansas City, USA, with participants coming from all walks of life and various sectors representing pharmaceutical research. It provided an opportunity to explore how government, nonprofit organizations, and academic institutions can define new models of working with the private sector to enhance drug discovery and development efforts, and bring safer, more effective drugs to the market more efficiently. While the meeting was a great start, we quickly understood that a more formal mechanism or place is needed to bring these divergent sectors together to talk to each other and to listen to each other on a regular basis, especially in an environment that is conducive to honest and candid discussions. Working on the book Collaborative Innovation in Drug Discovery reinforced the need for such a formal mechanism, and, hence, the birth of iDDPartners, a nonprofit think tank that I have founded to focus on pharmaceutical innovation. 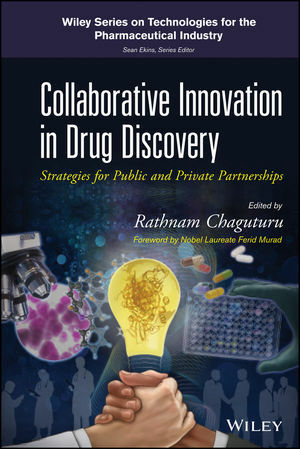 In your book, Collaborative Innovation in Drug Discovery, you present ideas for industry and academia to work together. This seems to fit with an increased trend in industry to outsource R&D efforts. How do you see such a partnership solving the problems you described? There is a fundamental problem in how these two divergent sectors view each other. They neither understand nor respect each other’s core missions. Pharma has its strengths and academia has its own strengths, and, for the most part, they are complementary. The gap between the academia–industry continuum is quite deep and wide, more than what I had ever imagined, or cared to acknowledge. Pharma, for the most part, lacks fundamental knowledge of disease biology and has no in-depth knowledge of what therapeutic targets to select and work on. With workforce attrition in full force, pharma turned its eye towards academia as a valued partner in delivering therapeutic targets to work on and to address questions regarding toxicobiology. Pharma is pouring millions of dollars into supporting research in academia, hoping that the new research will eventually lead to market success. It is too early to tell whether this is a viable business model or a knee-jerk reaction to a fundamental problem. The return on investment in academic research seems, at times, to garner headlines in trade magazines, to temporarily boost company stock performance, and, along the way, to get some nice publications in high-impact journals. With all the funding that academia receives so generously from pharma, it still laments, quite ungratefully, the lack of freedom and the undue emphasis on deliverables. For the academia–pharma partnerships to have a successful outcome, the ‘stakeholders’ must engage in open innovation during the pre-competitive phase and a collaborative enterprise (closed and competitive) when the clinical candidate looks promising. These two seemingly similar but distinct paradigms are evolving and have a transformative potential, when nurtured with respect and understanding, to correct endemic and systemic failures of the past. Are there any differences between drug discovery and development in academia and industry? The business of pharmaceutical research is like no other. It is a game of attrition of gigantic proportions. We know a lot about the physical manifestations of our diseases. However, we do not know whether we have the right therapeutic target, whether we will get a clinical candidate after screening hundreds of thousands of compounds, and finally, how long it will take to see a drug that reaches the patient. The investment by the United States National Institutes of Health (NIH) Roadmap program has brought academia to the forefront of drug discovery, at least in the pre-competitive space. Academia is the citadel of fundamental disease biology with a huge potential to unravel the mysteries of life and validate disease-relevant therapeutic targets. Clinical candidates are hard to come by from academic research, so it needs pharma because it is the latter that is the bastion of talent in medicinal chemistry. Biomedical research is multidisciplinary and requires active project management. Academic research is primarily driven by its principal investigator, and the project management concept is foreign to academia. Pharma’s erstwhile funding focus has shifted in recent years from handpicked, curiosity-driven projects to large integrated programs with a strong emphasis on the development of therapies rather than the documentation of disease biology. The academic scientist views this with a mix of appreciation and apprehension, maintaining that the industry-sponsored research is too applied, and is at the cost of basic science. Science doesn’t have to be esoteric, or science for the sake of science. It has to provide value, defined as benefit over cost, either in the short term or long term. The modern-day academic scientist seems to have not gotten this ‘core’ principle right. Many great discoveries have seen the light of the day only because of a necessity, not necessarily curiosity. Academic biomedical research has great promise. To transform big ideas into marketable products (drugs), academia must fully embrace the collaborative spirit and commit to achieving the common goal. Are there alternatives to the academic–industry partnership you support? Developing a drug is not a trivial matter. Medicine is inherently multidisciplinary and includes biochemistry, genetics, physiology, chemistry, and even sociology. The current therapeutics paradigm is based on cross-cultural contributions with fundamental origins in traditional/alternative medicines, augmented by combinations of academic and corporate development efforts and by joint academic–corporate initiatives. Key limitations in the formulation and development of medical response strategies emerge from fundamental limitations in knowledge transfer and cross-disciplinary redress of the scientific and practical obstacles to therapeutic development. Collaboration between academia and pharma is a necessity, at least in the pre-competitive space. However, we need a similar collaboration between “competing” pharma and biotech partners to make a sustainable difference in how we develop innovative drugs. Combination drug treatment in clinical trials is gaining prominence lately and is a welcome trend. The drug cocktail approach effectively contained the AIDS epidemic with dramatic outcomes. It is the new norm in cancer clinical trials. For decades the crop-protection industry has employed the practice of mixing pesticides with different mechanisms of action and with products from competing industry partners in eradicating pest or weed infestations. This is not always the case with pharmaceutical clinical trials. We always see a new drug mixed with an off-patent drug, but not two new drugs from two pharmaceutical entities. The pharmaceutical industry needs to put the patient’s needs first and cooperate and collaborate for the patient’s good. The new wave of biomedical research dollars is coming from billionaire philanthropists, who are declaring their own individual wars on diseases. These philanthropists are purpose-driven, willing to break down the traditional barriers and to make a difference in people’s lives. The funding, however, is primarily diverted towards “prestigious” universities, and the sponsored research might or might not withstand the rigorous scrutiny of their academic peers. The funding might also be directed towards diseases that afflict the families of the billionaire philanthropists, and who mostly happen to be people of North European descent. So the billionaires of the developing world and Latin America need to make note of the economic and racial aspects of this philanthropy, and step forward to address diseases that are endemic to their own societies. If you don’t take care of your own people, then who will? It is with much enthusiasm that we welcome the creation of “Partnerships to Accelerate Therapeutics” by The United States President’s Council of Advisors on Science and Technology to accelerate the discovery and development of medicines through alliances involving industry, academia, government, and disease foundations. The creation of TransCelerate BioPharma by the pharma giants is in the same vein. The Accelerating Medicines Partnership, under the auspices of the Foundation for the NIH, is another transformative effort in tackling global healthcare crises. This $230-million-over-five-years partnership between the NIH, pharmaceutical giants, and nonprofit disease foundations calls for the drug makers to collaborate, not compete, on drug discovery projects for Alzheimer’s, type 2 diabetes, and autoimmune disorders for now. The partners are to share their research findings with each other and the biomedical community at large. This is collaborative innovation at its best. Another equally attractive, game-changing partnership is one in which the partners share both risk as well as reward, such as the one between the German Cancer Research Center and Bayer Health Care, and between Scripps and Johnson & Johnson. Such a partnership could be based on milestone-driven incentives, and rewards ought to be commensurate with the degree of risk taken. Pharma would still be the major funding source, and the milestones would be met with deliverables. Your book collects the perspectives of many leaders from all sides of drug discovery. What was it like to coordinate and manage such a varied team? The goal for this book has been to assess the current state of drug discovery in pharma and academia, to identify the areas in which each of the institutions does its best and the areas in which gaps exist, and to explore ways we can establish a mutually beneficial partnership to achieve our common goal of bringing improved and safer drugs to treat the diseases afflicting mankind in developed as well as developing countries. The book was originally slated to address these topics in a dozen chapters, but the word about the thematic aspect of this book caught the attention and imagination of many who truly believe in the need for collaborative innovation in biomedicine. It was truly a pleasure in working with so many world-class thought leaders. The authorship is truly global in representation and the viewpoints emphasize perspectives from academia, pharma, disease foundations, nonprofit and for-profit research institutions, and governmental agencies. The book would not have been what it is without the time and energy of the contributing authors, and their vision of “the best is yet to come” through academia–industry partnerships. What spare time? But I need to make time for six-week-old Rohan, my first grandchild, my pride and joy—small enough to hold in my hand, but large enough to fill our hearts with immense happiness! Rathnam Chaguturu earned his Ph.D. at the age of 25 from Sri Venkateshwara University, Tirupati, India. After postdoctoral work at the University of Wisconsin, Madison, WI, USA, and Rutgers University, Piscataway Township, NJ, USA, he worked for Dow Chemical, FMC, and Sierra Sciences, all in the USA, for 28 years. In 2007, Chaguturu worked at the University of Kansas, Lawrence, KS, USA, and in 2011, he was recruited by SRI International, a nonprofit research organization, to help lead its Center for Advanced Drug Research in Harrisonburg, VA, USA. Today, he is CEO of iDDPartners, a nonprofit think tank focused on pharmaceutical innovation. Among other distinctions, Chaguturu is the founding president of the International Chemical Biology Society (ICBS) and editor-in-chief of the journal Combinatorial Chemistry and High Throughput Screening. Open Conf. Proc. J. 2011, 2, 130–136. Curr. Pharm. Biotechnol. 2010, 11 (7), 764–778.